Tetrahydrocannabivarin, or THCV doesn’t begin as cannabigerolic acid (CBGa). 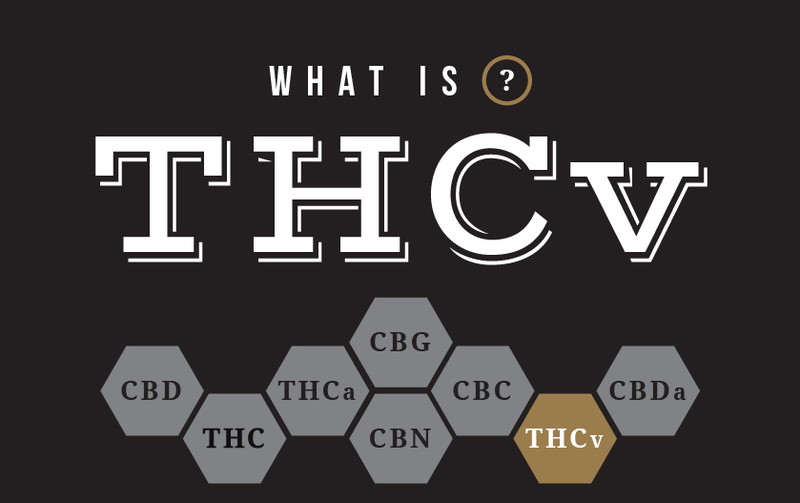 THCV is created from the break down of cannabigerovarin acid (CBGVA). CBGVA is broken down to tetrahydrocannabivarin carboxylic acid (THCVA) by the THCV synthase. At that point, THCVA can be decarboxylated with heat or UV light to create THCV. THCV is similar to THC in molecular structure and psychoactive properties, but it provides a variety of pronounced and altogether different effects. Both cannabinoids THC and THCV affect the same receptors, but they do so in a different manner as THCV produces a much different high. THCV is psychoactive, but causes more of a psychedelic, clear-headed effect, and it causes the effects of THC to hit you much faster. With this being said, THC effects also die off a bit more quickly with the presence of THCV. Tetrahydrocannabivarin (THCV) is actually an antagonist (a type of receptor that blocks or dampens agonist-mediated responses rather than provoking a biological response itself upon binding to a receptor) of the CB1 and CB2 receptors. THCV is an appetite suppressant. In contrast to THC, THCV dulls the appetite. This may be good for consumers focused on weight loss, but THCV should be avoided by patients treating appetite loss or anorexia. It’s believed that THCV blocks the rewarding sensations we experience when eating, often unhealthy, comfort foods. THCV has anti-convulsive properties. THCV seems to raise the seizure threshold for those with epilepsy. As a result, they experience less seizures. Most strains only contain trace, undetectable amounts of THCV, making it difficult to achieve the desired therapeutic effect. THCV is most abundant in sativas, particularly landrace strains from Africa, like Durban Poison, and the haze strains. Ask about parent genetics as plenty of strains have hybridized African genetics that predispose it to a higher THCV potential. At FARM we carry strains such as Red Congolese and Sweet Skunk which contain relative amounts of THCV. Speak to any one of FARM’s knowledgable budtenders for dosing information, and other THCV alternatives.